Juneau – Today, the Alaska House of Representatives passed a resolution requesting that Alaska-focused assets of the National Oceanic and Atmospheric Administration (NOAA) be based in Alaska. House Resolution 8 was put forward by the House Community and Regional Affairs Committee and carried by Representative Jonathan Kreiss-Tomkins (D-Sitka). 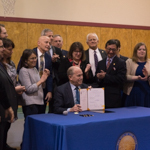 Juneau – Earlier today, Alaska Governor Bill Walker was joined by members of the Alaska Legislature and dozens of elementary school students for the official signing ceremony for legislation to early fund Alaska’s K-12 public education system. The signing ceremony for House Bill 287 was held at the Harborview Elementary School in Juneau. HB 287 authorizes the State of Alaska to spend $1.3 billion for K-12 education and student transportation. 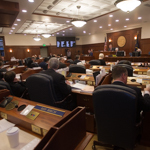 The bill was introduced at the beginning of the Second Session of the 30th Alaska State Legislature by House Finance Committee Co-Chair Rep. Paul Seaton (R-Homer). HB 287 was co-sponsored by 22 State Representatives and 12 Senators. Juneau – Today, the Alaska House of Representatives passed legislation proposed by Governor Bill Walker to issue bond debt to pay off the more than $800 million balance the state owes for oil and gas tax credits. House Bill 331 would discount the tax credit payments to more than cover the additional cost to the state of interest on the bond debt, which the state will then pay down over the next decade. In this manner, companies owed credits receive cash they can reinvest in additional development today while keeping the measure revenue neutral or revenue positive for the State of Alaska.